Camp Pennsylvania: I’m talking with Jenn Naugle today. She’s the Park Manager at Tobyhanna State Park in Pennsylvania. Jenn, why don’t you get started with giving us a little bit of history about Tobyhanna State Park? Jennifer Naugle: It was an artillery range that was used through the ’40s. The Army would use the facilities – the site – to test some of their artillery, and unexploded shells and shells would wind up on the forest land. It was all Federal land. And then, in the ’50s, they went ahead and turned most of the land over to the State, which was then responsible for carving out State Gangland, and Tobyhanna State Park. So, today we have forest land where once was artillery range. CP: Oh, okay. Now, when you go to the Tobyhanna State Park website, there is: “Caution: please read.” And I’m reading through this and it says that you can find old unexploded artillery shells. I have to assume though that it wouldn’t actually be a Park if there was a real threat of shells exploding on guests. Jennifer: Absolutely. The danger is very minimal. The times when folks have encountered any of these unexploded artillery is not on the trails or in the heavy use of the Park. Actually, the US Army Core of Engineers had a company come in and they’re finishing up the work as we speak, where they’ve actually canvased all the forest land that was the former artillery range. They have founded unexploded ordinants and then they have disposed of them properly. Jennifer: In the last twenty years, anyone that finds an unexploded shell is asked to not touch. Obviously picking them up and shaking them or throwing them against the rocks is a very bad idea. But just there, sitting out there in the woods, there’s no problem. They’re not like land mines. If you stepped on one, it would not be a problem. So, the concern is just people that pick them up and shoot at them or mess with them. CP: Right. And you certainly have plenty of YouTube videos of people doing things dumber than that, so hopefully they’re able to find all of the shells out there. Jennifer: Yeah, and we do have warning signs at trailheads and in the front country of the Park, warning folks, if you’re parking here, to access the Park and if you find unexploded ordinants, just leave them alone and let us know so we can come out and have experts take care of them. CP: Okay. Now, what types of camping do you offer there? Jennifer: Tobyhanna State Park is considered a modern facility. We do have campsites that have for pets or not pets. There are no electric hook-up sites at this time, but the bathroom facilities in the campground have full hot running water. Hot and cold running water. Showers. Sinks. Toilets. All of that. Jennifer: So, it’s a modern facility. Some paved parking pads and pet versus non-pet camping. CP: Okay. And what are the most popular activities for guests there? Jennifer: Besides the campground of course, we have a lake where a lot of fishing, boating, and swimming takes place. There’s several trails in the Park. Folks like to walk or bicycle the trail, especially Lakeside Trail. It’s our most popular. It literally follows around the shores of the lake and is about a five-mile trail. CP: All right. And what are some of your favorite attractions in that area outside of Tobyhanna State Park? Jennifer: Well, Tobyhanna State Park is not terribly far from Strasbourg and the Delaware Water Gap. Maybe about a half hour drive will get you to the New Jersey border and the National Recreation Area as well as there’s several ski resorts in the area. There are the crossings. The shopping outlets and such, but specifically if you’re looking to get in the outdoors, then you could do it all here at Tobyhanna or it’s neighboring (Unclear 4:03.7) State Park. Plenty of miles of hiking. This time of year, in the fall, we have quite a bit of hunting going on. Not an ordinate amount, but there is wildlife here in Tobyhanna, and so folks will come up and watch eagles. They’ll look for deer. They’ll look for bear and turkey, and so forth. CP: Fun. Two more questions for you, Jenn. 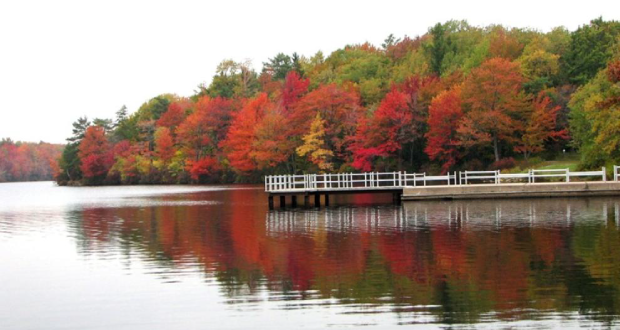 If you were going to spend just one hour hanging out Tobyhanna State Park, how would you spend your time? Jennifer: I would make a point to see the lake, whether it’s spring, summer, fall, or even the ice of winter. The ice and snow of winter. Make a point to stop off at any of the parking areas right along Route 423. Get a view of the lake. Maybe do a little short walk. Not, of course, the five-mile lakeside trail, but a short walk from one end to the other. And an hour would get you just a tip of the iceberg. CP: Oh, okay. And last question: if you were going to spend just one night at Tobyhanna State Park, which specific campsite would you stay at and why? Jennifer: Well, I don’t happen to prefer camping with pets, so I would pick one of the sites in the back of the loop. It’s a little more removed from some of the dog barking that minimally occurs and you’re right there next to a trailhead. I couldn’t give you the exact site number off the top of my head, but one of those non-pet sites towards the back of the campground would be my preference. CP: Perfect. Thanks for that tip, and thank you, Jenn, for taking some time out of your day to talk to us about Tobyhanna State Park in Pennsylvania. Jennifer: My pleasure. Thanks for giving me a chance to kind of speak up the Park.